B.Tech, a web series from YuppTV Studios is coming forth to the international audience today on YuppTV. Starring Abhay Bethiganti, Meraj Ahmed, Upendra Varma, Kaushik Ghantasala, Madhulatha Reddy, Tanvi Desai etc., the web series is written by Tharun Bhascker, the man who had directed Pelli Choopulu, Ee Nagaraniki Emaindi, etc. The trailer was released recently on 13th November and all the episodes of “B.Tech” are available to the international audience on YuppTV. B.Tech is the story of three engineering students, Vikram who wants to be a Filmmaker, Akhtar- a Bike Enthusiast, and Hari- an aspiring entrepreneur, with highly defined dreams and aspirations but lack the means or support to achieve them. The Web series gives us a glimpse of their lives, revealing their plans, struggles, and all their emotional highs and lows that can make the audience binge-watch the entire series in one night. The trailer itself shows us what the entire series is about. If you hadn’t watched the trailer yet, you can watch it at B.Tech Trailer . Starting off by showing the three main characters, the trailer first introduces Vikram in a funny way. Giving us glimpses of his life, the trailer then moves onto Akhtar revealing his passion. Then comes the introduction to the life of Hari who is a budding entrepreneur. Revealing the seriousness of the story after a minute the trailer steeply steals our attention making us more involved in the characters’ lives. Though slightly the usual reactions given by friends and acquaintances when anyone expresses their ambitions are flashed from the start, it suddenly demonstrates them more seriously in the second half while taking us along the twists and turns the lives of all the three characters take. Will the three be able to survive and manage to achieve their dreams? This will only be revealed in the web series. 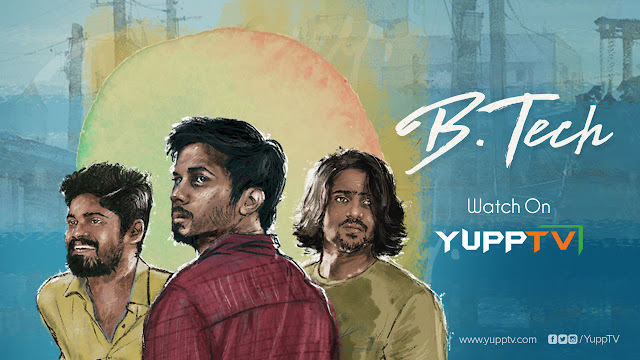 Binge Watch all the episodes of “B.Tech” Web Series today on YuppTV. Available in all countries except India.